Does one or both halves of your P1800/1800S dual temperature gauge not work ? If so, you're one of the many. It's very common for one or both parts of those gauges not to work. If only one half works, more often than not it's the water temp half that works. Why is that ? Well, before we get into why they fail it's probably best to give you some information on how those gauges work. For those of you who understand all about how Bourdon Tube gauges work you can skip down to the "What can VolvoSolutions do about this problem ?" section. Temperature gauges on modern cars are usually electonic or electromechanical. Usually, the temperature of the engine coolant is measured by means of a thermistor type sending unit which has an electrical resistance that varies with temperature. Usually, the resistance of the sender is high when it's cool gets lower and lower as the temperature of the coolant (and hence the thermistor) increases. As the resistance of the thermistor decreases, the amount of electrical current going through the bi-metallic spring in the temperature gauge increases and this causes the gauge needle to deflect more since it's mechanically linked to the bi-metallic spring inside the gauge. This is how the temperature gauges on the 1800E and ES cars work. The same goes for the temp gauges on the 140s and 122s. The rather zooty & retro looking dual temperature gauge in the P1800 and 1800S cars work on an entirely different principle. They are "Bourdon Tube" gauges which are purely mechanical devices. Instead of having a thermistor type sending unit they have a sealed copper or brass bulb type sender which is partially filled with a volatile liquid such as ether or acetone. Inside the gauge is usually a "C" or coil shaped hollow copper tube which is referred to as the Bourdon tube. The sender bulb and Bourdon tube are connected to one another by means of a very small diameter metal capillary tube forming a closed (sealed) system. When the sender bulb is heated the liquid inside it volatilizes and the gas pressure inside the Bourdon tube increases. The hotter the sender bulb gets the vapor pressure in the Bourdon tube goes up proportionally. As the pressure inside the Bourdon tube rises the more it tries to straighten itself out just like a long tube shaped balloon does as you blow more air into it. In most Bourdon tube gauges the Bourdon tube is mechanically connected to a dial needle so the needle is made to deflect slightly as the Bourdon tube changes shape. The device is calibrated mechanically so the dial needle shows the correct temperature on the dial face. It's actually a pretty simple system and very reliable so long as there's no leaks in the system. As soon as there's a leak, however, the volatile substance in the sender bulb will escape and the gauge will no longer work. 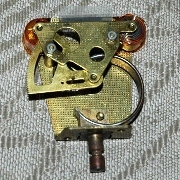 The mechanism shown in the photo just above and to the left is the actual instrument part from an 1800S dual temperature gauge. The Bourdon tube is the flat tubular spring shaped like a backwards "C" which is soldered to the brass base where the capillary tube connector is. (The capillary tube is missing from this gauge.) There are two of these devices in the gauge housing. The lower one shows the oil temp and the upper one displays the coolant temp. What happens with this gauge is that when the Bourdon tube tries to straighten out it and moves a transmitting arm which influences the indicator part of the instrument through a calibrated reduction drive. The indicator is in the form of a plastic film band which connects the two rollers together. The first part of the film is black and then it becomes colored. Yellow is used on the water temp gauge and blue is used for the oil temp gauge. The film strip is visible through a thin slot in the gauge face (see picture at top of the page). As the temperature increases the rollers are turned more and more pulling the colored part of the film further upwards behind the viewing slot. This gives the illusion of a thermometer with the colored part of the film strip being the mercury in the thermometer. The temperature is indicated by where the top of the colored part of the film strip is relative to the markings on the gauge face. It's definately a "Reub Goldberg" setup alright but it's incredibly cool and quite charming to say the least. As an aside, it's interesting to note that the dual temperature gauges used on the '61-'69 1800 coupes were completely unique to the Volvo 1800. 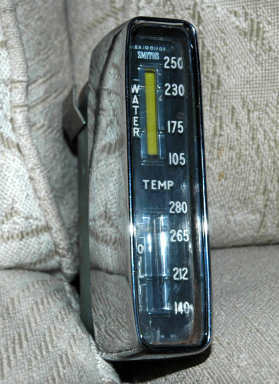 Smiths supplied instruments to many other makes of cars including MG, Fiat, Lotus, Sunbeam and several others, however, the temperature gauges they made for those other cars were dial type gauges. Some of the temp gauges they made for other types of cars were also Bourdon tube type gauges but as far as we know the funky film roller type Bourdon tube gauges used on the early 1800s were the only gauges like that in any car ever made. That makes them very special and a real part of automotive history. Aside from the obvious safety reasons, this is another reason why we think these gauges ought to be restored to good working order in every P1800 and 1800S that's still out there being driven or shown. But why do the funky temp gauges on the '61 - '69 1800s fail so often ? The answer has to do with the metallurgy of the capillary tubes that Smiths used. Over time those steel based tubes have become very brittle and quite susceptible to cracking. Once they crack, all the voltatiles are released to atmosphere and the gauge ceases to work. The oil temp gauge is the most likely one to go because it has a much longer capillary tube than the water temp gauge and it goes through more twists and turns on it's way from the back of the gauge on the instrument panel out through the firewall and down to the oil sump. What can VolvoSolutions do about this problem ? We can restore these gauges by removing the brittle old capillary tubes and replacing them with new flexible copper based tubes like those which are used on modern day F1 and other type race cars. The copper based tubes that we use are well armored and will remain quite flexible and resistant to cracking for many, many years. If you send us your dual temp gauge, we'll replace both capillary tubes and sender bulbs and send you back a fully functional, calibrated instrument. What does this service cost ? While this service may not be unique in the business, our price certainly is. Where most instrument shops will charge you anywhere from $200 to $300 for this service, we will do it for only $175. 2. We're more innovative than our competition. Through innovation we've managed to reduce the costs we incur in peforming this service and we pass those savings along to our customers. Do you warranty your work ? Yep. We give a 90 day guarantee on our restored temperature gauges. The 90 day warranty period starts when you receive the gauge back which is deemed to be 14 days after we ship it out to you unless it's being shipped overseas by surface mail. Where do I send my Temperature gauge to ? See the Contact page for our shipping address.